9.12 update – Strong stocks bounce back to previous highs easily. Now the real test, can it break through resistance? I’m giving it the benefit of the doubt. 9.02 update – I like what I see from this pullback. It could pull back a little more to $33.75-34 level, but that is about the area I expect this to bounce. This is a picture perfect chart setup for the sort of stocks I scan for each night for tradewithZEN. There’s one minor flaw that prevented this stock from making my personal list – it’s volume. It trades less than 250k shares avg daily volume and this is a personal rule of mine but you may not have that same criteria so I felt it worth pointing out as a potential trade idea. 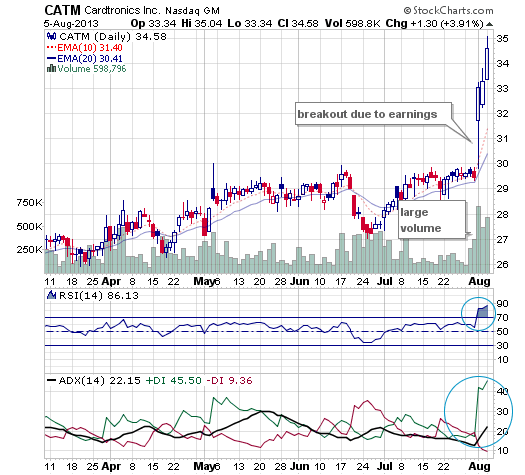 Strong RSI, Strong ADX, Big Vol on Catalyst = future price appreciation. 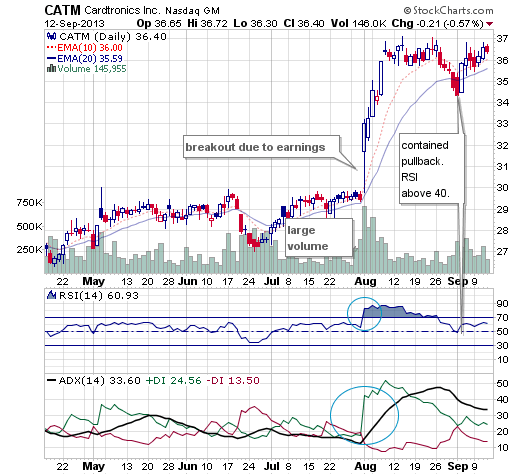 Keep an eye on this stock and if more volume moves into it over the coming quarters I may revisit this idea.